Guest post by Dr. Onur Tokdemir, from Qatar Project Management (QPM). In the current economic climate, developing an innovative Construction Project Management Firm is a difficult endeavor; one which is made even more complicated when the firm is driven by the idea of becoming one of the world’s top five Project Management firms by 2020. The culmination of these elements present a difficult undertaking for any IT department. This paper will articulate the strategy, struggles and achievements faced by an evolving firm that has embrace this goal while implementing Enterprise Resource Planning (ERP) and Project Management Systems (PMS). PMS and ERP systems are the intellectual capacities of any Project Management firm. In one aspect ERP systems simplify Project Management and Accounting by providing project controls, a full financial overview, real time integration of procurement and financial management processes, resources management, human resources, planning and proposal. On the other hand, PMS provides the necessary tools to properly manage projects including construction scheduling, document control, and project communications to isolate only a few examples. Many solutions available in the market tackle these aspects individually; however, to create a comprehensive solution that integrates these different elements requires extensive implementation planning, training and execution. This presentation will explore these processes while reflecting on difficulties and develop a focused conclusion. The process of corporate evolution and obtaining success is informed by a company’s desire to deliver projects on time, within budget and adhere to specifications while managing project risk. Extensive amounts of time and resources are dedicated to selecting and designing projects, it is thus vital that projects are adequately managed in organizations if they are to achieve key performance objectives (Raymond and Bergeron, 2007) (1). The emergences of new technologies have created systems that help facilitate the diverse needs of Project Management (PM). People now use central data repositories to solve the problem of synchronization as data is physically replicated on many different servers. This replication creates a synchronicity enabling everyone to be working with one up-to-date data source (Romano et al, 2002) (2).In addition to these technological frameworks, the globalization of markets and increased competition create the necessity to integrate global managerial and business processes in corporations. This corporate integration is achieved as a result of people working from geographically diverse locations while collaborating on a given project. Corporations expect teams to cooperate on an international scale dealing with business problems and their global impact (Evaristo and Fenema 1999) (3).Qatar Project Management (QPM) embraces these technological and global ideologies and uses them to provide Project Management, Design Management, Construction Management, and Contract Administration with other associated Project Management functions. The organization was established with the vision that QPM will become one of the top five project management companies in the world by 2020. Reinforcing this vision is the fact that QPM recently won the award for Fastest Growing Firm in the Gulf by Arabian Business (4). QPM is well position in the MENA (Middle East and North Africa) region and plans to open more offices in Europe and Asia. The purpose of this paper is to explain the challenges faced during the creation of QPM’s state-of-the-art Project Management Information Systems in terms of the Initiation, Planning and Implementation stages. Through this process of exploration the work will highlight the different phases and formulate a conclusion on the findings. Accurate information is essential to the design and execution of management decisions which strategically allocates resources in a project. Influential decisions coming from project planning, organizing, direction, motivation, and control must be based on up-to-date and relevant information. Even motivating a project team and distributing leadership responsibilities requires correct information which enables associates to make informed decisions (David and Ireland)(5). QPM’s PMIS perform a mission-critical role by detailing a complete picture of all projects throughout all the phases of the project life cycle. Therefore, QPM’s Executive Committee set up a special team tasked with the exploration of existing systems, reviewing other organizations, searching market for integration solutions, implementing solutions to resolve the problems and create a state-of-the-art PMIS. The committee’s first assignment was to assess the existing frameworks and isolate issues inherent in their operation.QPM started to acquire Project Management Systems just after the establishment of the company which allowed the structures to be totally integrated. Initially Microsoft SharePoint, Oracle Primavera P6 and Oracle Contract Manager Licenses were purchased and started to be used in the new projects (Figure 1). Microsoft SharePoint was selected as the collaboration platform, file sharing and web publishing tool. SharePoint was also customized to be used as a document management tool with the help of Oracle Contract Management. There was also a dashboard solution created using a combination of Microsoft SharePoint and Microsoft .NET programming. More licenses were purchased as the number of staff increased in order to accommodate the company’s growth. The evolution was so rapid that within a two year period QPM reached more than 400 employees and required larger integrated solutions (Figure 1). • The system did not include any viewer with mark-up and notes capabilities, a third party red lining tool was needed. • System did not enforce proper document protection for the files sent to remote parties. • The system did not have the ability to do bulk upload and bulk download with the proper meta data. • There was no defined auto numbering. • The system did not have advanced search capabilities. • There was no combined search for full text, indexing fields, document categories and folder location. • There was no ability to attach multiple documents to one design review package. • The system did not assign user rights on every object in the storage tree. • There was no standard management reporting was available within the system. Some of these issues could be resolved with extensive programming but customization was taking too long to meet QPM’s corporate needs. There were also other issues as most of the directory structure created earlier was not satisfying the new project requirements and the data immigration was becoming a critical issue. On top of these challenges customization was an ongoing process and there were delays in training the users for the new features. Oracle’s Primavera Contract Management was introduced in addition to SharePoint to be used together as a document management, job cost, and field controls solution that keeps construction projects on schedule and on budget through complete project control. The documents kept in SharePoint and communicated through Primavera Contract Management included Issues, Transmittals, and Correspondence. Using both of the systems together increased the burden on training and created confusion among users. By integrating the two elements some redundancies were discovered in the systems. • Specific Project Status: Tracked the exact progress of construction by phase, zone, building type, etc. • Metrics: Tracked key commodities,All updates were manual and there was significant effort and resources allocated to collecting and updating the information. In addition to this there was no custom reporting available since no database connectivity existed. Some critical issues were associated with the location of the international site offices. These offices have limited internet connectivity and synchronization with the headquarters was quite difficult. There was also need to including Building Information Modeling (BIM) into the new system. BIM implemented in several major projects and therefore there was a need for maintaining and managing models properly. The model management had to be handled differently than traditional drawing management. There were also special requirements in managing BIM related services such as clash detection between different trades during the design and construction process. QPM recognized Integrated Project Delivery (IPD) as a preferred delivery method and therefore investing in BIM became a central focus.Once the issues are identified, there were discussions about establishing the target budget. As Liberatone and Pollack-Johnson (6) stated decisions concerning PM software selection and usage have significant resource implications. Therefore a target budget and schedule was determined. These utilized as baselines later on the implementation stage. The PMIS is a vital part of communication for the project as its stores knowledge, plans, drawings, practices, procedures, standards, guidelines, and methodologies to make them readily available prior to making a decision or taking action. A single store of information facilitates the collection and recovery of key data at any time-during planning, project implementation, and post project activities (David and Ireland) (5).The team’s first assignment was to explore the problems associated with the system as explained in the earlier section. The next step was to search the market for existing integrated solutions and find out if they can be implemented in a similar way within QPM’s organizational structure. However, since several systems were already implemented it was not economically feasible to acquire an out of the box solution to replace all the existing systems. There was also a need to implement an Enterprise Resource Planning (ERP) system so the team initially focused on integrating ERP with existing systems to resolve issues restricting document and drawing management. The team handling this project selected the Microsoft SQL Server as the back end database solution. The ability to securely and reliably store, centralize, manage and distribute data to users is a key element of business applications and SQL Server 2008 provides businesses with a high performance database platform that is reliable, scalable, and easy to manage. Both ERP and PMIS were planned to be installed and integrated over SQL Server (Figure 2). There were several meetings held with different user groups from the executive level to the administrative level to get feedback about the system new ERP setup. The system plans had fit into the culture of the corporation and were created with the help of outside consultants and the plans were later approved by the PMIS committee. 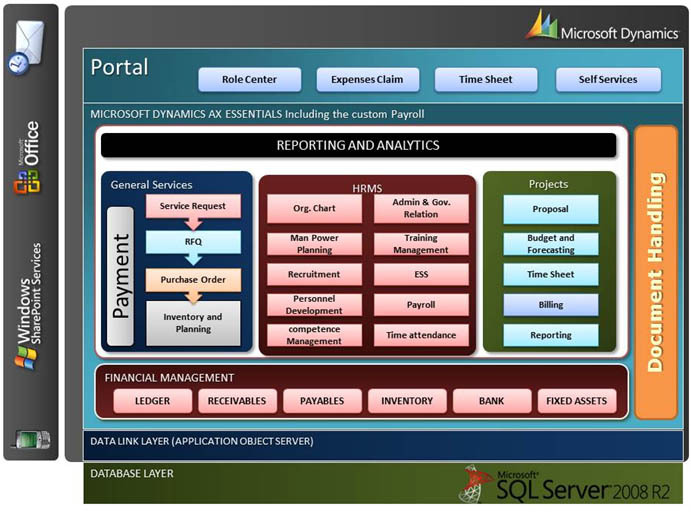 Microsoft SharePoint was used as a portal for most of the ERP functionality. 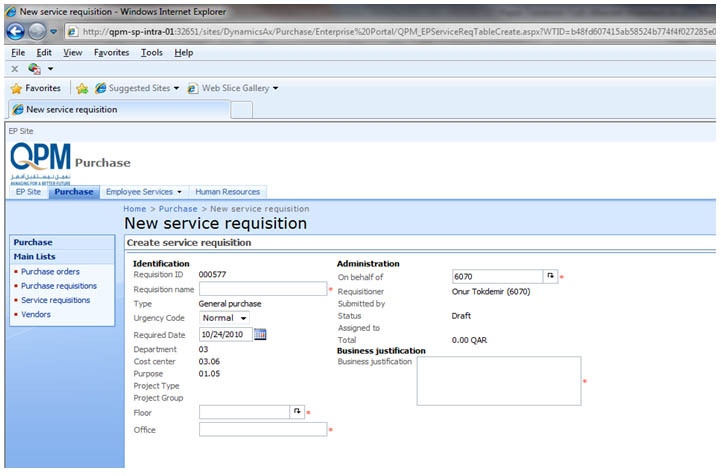 Different users access the services and timesheets through customized SharePoint Pages. All user interfaces were planned with functionality in mind by in-house application developers with input from the corporate communications department.The Oracle Primavera 6 instances were installed on the Microsoft SQL Server Platform locally for ease of integration with the rest of the systems. The Oracle Contract Manager was installed on Oracle Platform; however there were third party connectors that can provide the integration with other systems. The team started to research the market for document and drawing management tools that could integrate with the current SharePoint. The new solution had to be able to synchronize with the existing one while providing proper reporting functionality. The Work Breakdown Structure (WBS), Cost Codes and Project related coding, security settings and directory structures were also finalized at this stage to conform to corporate standards and policies. The team visited all the project site offices to survey their existing infrastructure and PMIS software usage while documenting all relevant issues. After the plan was approved by the executive management, the team started implementation (Figure 3). The first step was preparing and customizing all the connectors that integrated the existing and proposed systems together. Once all the connectors were tested and configured, the ERP testing began. The ERP system was implemented in several stages, in the first stage all employee information was exported in to the system and the user information is then linked with active directory usernames. The system was first introduced to the Human Resources and Accounting Department and tested alongside the existing systems. The testing period took approximately one month and ensured that the system could function properly and satisfy the needs of these departments. Centralized project data made information available so that costs are always up to date and invoices can be generated quickly. Integration with Time sheet and Mobilization plan extends project and resource management by helping QPM getting the project, activity, and task data that is needed to drive analysis and reporting, collaborate effectively with project teams, accelerate time to market, and improve results. The ERP solution automated all general service, HR and IT services. The training department worked in-house to educate all the parties involved in the process. Groups were trained according to permission levels and during the testing period the training department provided continuous support along with the IT department.The new document management system called 4Projects acquired and implemented in parallel. 4Projects provided online management of models, drawings, documents, photos, video and other files. The system was customized to suit our project portfolio and organization. 4Projects has a powerful revision and mark up capability that helped us in our red lining and mark up requirements. Permissions management allowed us to manage who has access to view and edit files and powerful search engine help tremendously in locating files. This system also linked to Microsoft SharePoint and other systems via connectors.The committee worked on finalizing the new setup for P6 and Contract Manager to have a uniform Work Breakdown Structure, Enterprise Project Structure and Cost Codes across all the projects. This required an auditing of all existing projects and used existing standards to create a structure which enhances the new system. This process was vital in linking all relevant systems together since the same codes were utilized in BIM so that the infrastructure is ready to accommodate IPD for future projects.The P6 and Contract Manager are linked in order to share cost and schedule information and all the stand alone database installations are synchronized into the central Microsoft SQL database. This enables all relevant information to be kept at the headquarters where proper backup and redundancy exist. In places where limited connectivity was an issue, a local copy was left in that office to synchronize the location with the central office on a daily basis. Once the ERP system started to function as planned, the connectors were put in place to create a proper interface between the SharePoint, Contract Manager, P6 and the newly acquired document management system which utilizes the SQL Server. Currently, there is a new SharePoint page designed to centralize all information for reporting purposes. The reporting page incorporates several different versions according to user’s permission settings, for example the CEO has different viewing options that enable him to view higher level project information and overall summaries, while a regular user may only see a basic summary about a relevant project.Once all the systems were in place and central portal is implemented, through filters all the users have access to this area to view project relevant information. This area provided senior management all the necessary tools to view project progress and updates dynamically. The close out stage has just begun recently as the implementation is still a continuing process. Total system implementation is planned to be completed in early February 2011. • QPM’s corporate culture was resistant to change and had to be managed in order to achieve a successful integration. All plans and adjustments are communicated in a dynamic manner to all parties. This strategy of providing relevant information to end users is supported by posting details using the company portal and e-mails. Site offices are also visited on a regular basis to make sure all parties are brought into the collaboration process. • “I know the best solution” attitude was present while working with different departments that offered a challenge for the project. Several parties from Technical and Operations divisions wanted to take the ownership of the process and as a result executive level management intervened. These teams integrated into the project and contributed to the process. However, in order to make sure no one unintentionally sabotage the project committee members managed all requests that results in major modifications.• The existing systems had to be audited by third parties to get a clear picture of the system and identify all relevant issues. • Market studies had to be performed to find out “what is out there” and what could be utilized for QPM’s purposes. • Document management tools were extensively searched and meetings were held with their representatives. The cost of the selected system was an important factor. • All the necessary third party integration tools were identified and tested to discover if they fit into QPM’s systems. • Custom connectors were created in-house and tested rigorously to ensure efficient operation. • The final product went through several reviews and feedback panels and all the critical information was evaluated. • Two site offices were selected to test the system and during the test period all issues were documented and taken into consideration. • Currently, strong internal communication is very important and there is a daily and weekly team meeting to keep up with the process of collecting responses to the system. • QPM’s users are constantly kept in the loop regarding changes and the addition of new features. • Quality department is involved with creating all the processes and documenting them as new procedures which provides a reference point that enables the new system to be validated against these procedures. 1. Raymond, L. and Bergeron, F., 2007, Project management information systems: An empirical study of their impact on project managers and project success, article in press International Journal of Project Management. 2. Romano, N. C., Chen F. and Nunamaker, J. F., 2002, Collaborative Project Management Software, Proceedings of the 35th Hawaii International Conference on System Sciences. 5. Cleland D. I. and Ireland, L. R., 2002, Project management: strategic design and implementation, McGraw-Hill, 4th edition. 6. Liberatore, M. J. and Pollack-Johnson, B., 2003, Factors Influencing the Usage and Selection ofProject Management Software, IEEE Transactions on Engineering Management, Vol. 50, No. 2, 164-173. Borut Skornsek, B. Sc. CEng. Think QPM has done a great effort towards modern ERP implementation. Using modern solutions is a must, as correctly identified by the QPM, in order to manage large scale projects and fast growth. However, developing a system is one thing, using it is another. I wonder what are your experiences regarding prescribed working procedures, since this is constantly an issue I have to deal, when implementing systems to the construction companies. If possible the short cuts are taken….still don’t know why….awing proper use of the system..
Borut, thank you for the comment here and on LinkedIn. I appreciate the feedback. Your question on how the system actually work is something that other people have asked too. I’m trying to arrange a follow-up interview with Dr. Tokdemir for our “Construction Industry Podcast” to address it. Would you have some specific questions for him? If we manage to arrange this interview I could ask him personally. I read this article. I also agree with you. Such a these elements present a difficult undertaking for any IT department. Nice Article. I really happy to read this article. It is best information for me………. I think that whatever direction that QPM is heading, as long as they don’t bury their dedication to the customers in storage, they should be able to do just fine in whatever way they choose to move forward.